Tag Archive | "Marching Red Hawks"
Things are heating up out on the football field at Cedar Springs High School this week. The Marching Red Hawks are spending some lot hot days practicing for their new show this year titled “Fall of the Wall.” The show is based on the fall of the Berlin Wall, and includes “Carmina Burana Part III,” “Moscow 1941,” “Another Brick in the Wall,” and “Ode to Joy.” Band directors are Adam Borst and Ryan Shaw. They are marching 106 students. 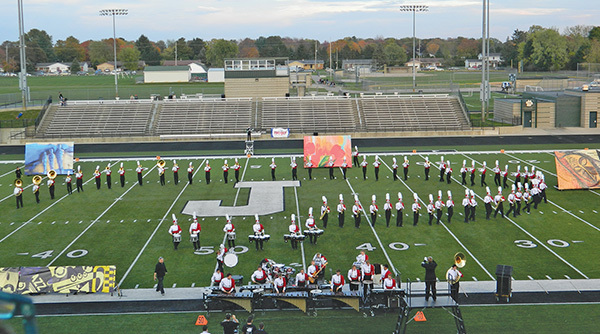 The Marching Red Hawks have gone to the state finals of the Michigan Competing Band Competition two years in a row. The students will give a free sneak peek of this year’s show to the community on Friday, August 5, at 6:30 p.m. at Red Hawk Stadium.